Tintin in Tibet is the twentieth book in the long running Tintin series of illustrated adventures by Hergé and was first published in 1960 – thirty years after the first Tintin adventure, Tintin in The Land of the Soviets. The story begins with Tintin on holiday in Switzerland with his good friends Captain Haddock and Professor Calculus plus, of course, Snowy, his beloved dog. Returning from a brisk walk in the mountains with Snowy, Tintin goes back to his hotel to meet Captain Haddock – who is unsurprisingly enjoying the holiday in a more sedate fashion and would much rather read the newspaper with a drink close to hand than clamber over rocks all day. The Captain shows Tintin a newspaper headline about a terrible plane crash high in the remote and icy mountains of Nepal. ‘Poor devils,’ remarks Tintin taking a look at the article. ‘They wouldn’t stand a chance of surviving up there.’ Later that evening, Tintin dozes off during a game of chess with Haddock in the hotel and has a vivid nightmare – which wakes him with a jolt – about his Chinese friend Chang Chong-Chen. He dreamt that Chang was half buried in snow and calling to him for help. It’s always strangely comforting and a real pleasure to slip between the pages of a Tintin adventure with characters you’ve come to know so well and the crisp, colourful art of Hergé. Tintin in Tibet is a particularly strong entry in the series because of the attempt to do something slightly new. Tintin books, which Steven Spielberg once said were an influence on the globetrotting Indiana Jones films, are often exotic with far flung locales but Tintin in Tibet takes us deep into the spectacular mountains of Nepal and throws a great deal of mysticism into the mix with Tintin’s strange dream, remote monasteries and monks who share spiritual visions. Plus of course the infamous Yeti who may or may not be lurking around the expedition. ‘The Abominable Snowman!’ snorts Captain Haddock when their guides assure him that the Yeti is real and not a myth. ‘That’s a good one! Fairy stories.’ The Captain is not laughing though when he suspects the Yeti may have swiped his precious whiskey supplies in the night. ‘You odd-toed ungulate!’ Haddock’s escapades are great fun in the book as usual and I especially like a splendidly surreal daydream he has featuring Calculus that features some very funny artwork. Captain Haddock is a great character, not just because he is funny, but because he’s a marvelous counterpoint to the idealistic Tintin. Haddock is flawed and human and a great complainer so we relate to him but he will always ultimately do the right thing – even at great risk to himself – so we both like and admire him too. 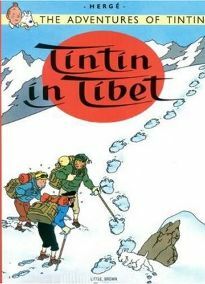 Tintin in Tibet is a different type of Tintin book because there are no nefarious villains for Tintin to battle and match wits with. Instead he is battling the elements and mountains of Nepal because of his unshakable belief that – contrary to all available evidence – Chang is alive and needs his help. Calculus only makes a brief appearance and the comically incompetent Thompsons are absent from the story. The humour remains though and Captain Haddock is as amusingly accident prone as ever. The author of the Tintin books, Hergé, had been having severe personal problems before he created Tintin in Tibet. He had suffered a nervous breakdown several years before because of the pressures of producing the Tintin adventures and his 25 year marriage broke down. He was plagued by recurring nightmares which were dominated by whiteness. A psychoanalyst suggested that Hergé should abandon Tintin but Hergé confronted his nightmares instead by writing and illustrating Tintin in Tibet – with large portions of the book set in the snowy and barren landscapes of the Himalayas. Because of the very personal nature of Tintin in Tibet it was Hergé’s favourite out of all the books in the series. Although perhaps not as fast-paced as some other Tintin books and more philosophical, the story is still a wonderfully escapist one with ice caves, rock climbing, avalanches and a huge snowstorm at night which Tintin becomes trapped outside in. The plane wreckage – which is used as a temporary sanctuary by Haddock and a guide at one point – is strewn across the wild landscape and creates a vivid atmosphere. Hergé also enjoyably includes rivers and small jungles on the epic journey of our heroes. The expedition camping out each night under the stars also supplies some great moments, my own personal favourite being when Captain Haddock is shocked to hear the booming operatic tones of Bianca Castafiore coming from a radio near his tent and, just for a moment, assumes the absolute worst. ‘She’s HERE, by thunder! That woman follows us to the ends of the earth!’ The main theme of the book though is friendship and we are always very eager to follow the expedition to its end see if Tintin and his friends can find Chang in this vast wilderness. Tintin in Tibet is a great book and highly recommended. No Comments on "Tintin in Tibet"